Extracted from the stem and outer skin of the plants Corchorus capsularis and C. olitorius, jute is a strong vegetable fiber and ranks second only to cotton in terms of world production quantity. During the Industrial Revolution, jute yarn became an important source of sackcloth – known variously as hessian, burlap and gunny. At present a host of innovative products with high value-addition has been developed. Typical application of jute includes floor coverings, jute fiber composites, geotextiles, nonwovens, paper pulp, technical textiles, chemical products, handicrafts and fashion accessories. 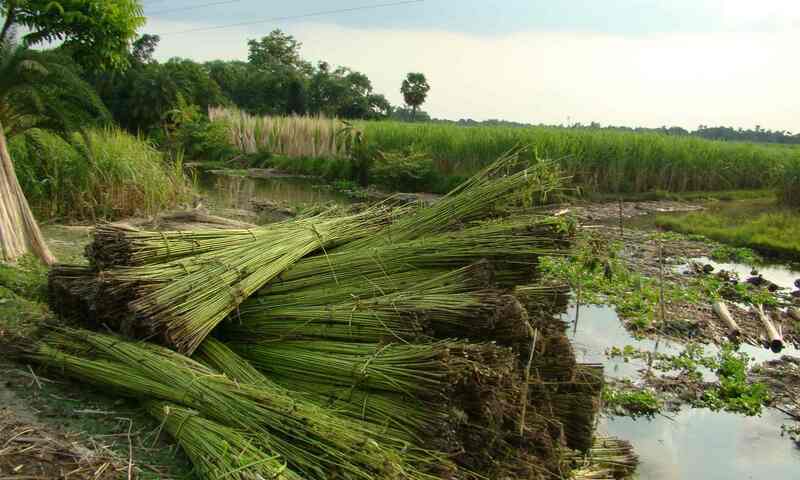 The jute plant flourishes in climatic conditions of Bangladesh and West Bengal in India. These are world’s main jute producers. Small amounts of jute are produced for example in Myanmar, Nepal and Brazil. Generally jute crop production takes place in micro and small businesses. In India and Bangladesh it is estimated that some 4 million farmers earn their living – and support 20 million dependents – from jute cultivation, while hundreds of thousands work in the jute manufacturing sector. The plant stem is cut close to the ground level and left in the field to defoliate. The stems are retted in gently flowing water over a period of one to three weeks. Retting process is complete when the outer fiber layers of the stem are easily separated from the inner woody core. The fiber is stripped by hand from the stem. Then washed and dried and made ready for sale. The jute sector is labour intensive with limited mechanization. Generally very small amounts of inputs such as fertilizer and pesticides are used. The world jute production in 2016 is estimated at 3.310.000 tonnes. Jute is the world 2nd largest natural plant fiber after Cotton. The jute fiber production is mainly n Bangladesh and India. The production in Bangladesh is estimated at 1.344.000 tonnes. The estimated number of jute farmers is 750.000. The total work force is 2.500.000 persons. Bangladesh exports around half its annual production as raw fiber, and half as manufactured items. The jute fiber production in India in 2016 was approx. 1.900.433 tonnes. More than 80% of the jute produced is consumed locally in India. India exports only 200.000 tonnes of jute products, the remainder being consumed domestically.